Rat poison has been made very palatable and tasty to lure rats to eat it. Most dogs, for the same reason, cannot resist it. If you see your dog eating rat poison, take him/her to the vet straight away. The vet can induce vomiting and start your dog on vitamin K treatment, which counters the effect of the rat poison and assists the body to help the blood clot. Treatment may have to last as long as 4 to 6 weeks, depending on what type of poison was ingested. Critically ill animals that have already started bleeding may need blood transfusions. Laboratory tests can also determine how badly affected an animal’s clotting ability is after eating rat poison. Dips containing Amitraz and tick and flea collars or spot-on treatments containing Pyrethrins and Pyrethroids may have a toxic effect on the nervous system of animals. They cause an over stimulation of nerve points resulting in muscle tremors and seizures. Always read the label on any product used to kill ticks and fleas and make sure which species it is intended for! Cats are extremely sensitive to these products and will die if such products are consumed. Never use a product on a cat that has been registered for use in dogs only. It will kill your cat. Products like the pesticide Temik which contain carbamates, causes over stimulation of the central nervous system, as they block the production of an enzyme that stops the breakdown of a neurotransmitter (a substance which conveys neurological impulses between nerve points). This leads to excessive nerve stimulation which results in muscle twitching, tremors and seizures. Dogs that have been poisoned may vomit, have diarrhoea, have a slower heart rate and have extreme difficulty in breathing. They usually die as a result of suffocation. Treatment consists of supportive care, as no antidote exists. 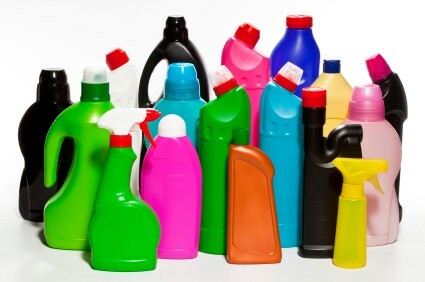 Other products, which are commonly kept around the house for maintaining the garden or house, like many of the insecticides, pesticides and solvents which contain organophosphates may be highly lethal to pets. The symptoms are similar to the symptoms for the carbamates, but if the poisoning is detected early, it can be treated with an antidote and supportive therapy. This is one of the most dangerous poisons kept in almost every household with a car, and cats and dogs will drink it readily because it has a sweet taste. A teaspoon of antifreeze can kill a cat! Ethylene glycol is metabolised in the liver to a substance that binds calcium in the blood, and forms crystals in the kidney. These crystals cause damage to the kidneys which results in acute kidney failure. This happens extremely fast. Within an hour after pets have drunk the antifreeze, the first signs may appear. Pets appear drunk, are disorientated, can vomit and are very listless. Within a day their hearts suffer damage, and within 3 days, they have irreversible kidney damage. They will stop urinating and go into a coma and die. Patients can be successfully treated but treatment must be instituted within the first 8 hours after ingestion. Initial treatment will be tomake the animal vomit and dose them with activated charcoal to prevent further absorption of antifreeze. A substance will then be administered which competes with the active ingredient in antifreeze and prevents the effects of ethylene glycol further damaging the body. Fluids and supportive care will be administered during the whole treatment process. Sadly, most pets are treated too late, and have to be humanely put to sleep, as their kidneys fail. Store this product far away from your pets. It is always best to rather be safe than sorry. Never give your pet medicines that have not been prescribed to them by the vet. Feed your animal a properly formulated pet food only, and always ask the vet or the veterinary team at the practice which products are safe for use on your animal.